Building your business website is only one piece of the complete effort which puts your organization on the digital map. Once you have a website built, you have to put it in front of web users. Without a visible online presence, your website may as well not exist. You can use your business blog to add dispatchable information and content to your business website, making itmore attractive to visitors. Giving people something to read and explore will encourage them to stay longer. Here are a few ways to make your business blog a more welcoming and attractive space on your website. Building a base of loyal readers is an excellent way to boost your web presence, and thus, your business. Search engine optimization is the key to boosting your organization’s online visibility. Once you have mastered SEO, your business blog will take on a more dominating role in the SERPs (Search Engine Results Pages). Ranking higher in the SERPs will make your website’s content more visible when a web user searches relevant terms to your organization. Ranking on the first page of the SERPs is vital to success, as no one really looks at the listings on the second page of the results. Create a way for your readers to share their interest in your business blog on their personal social media profiles. When friends share with friends, your content immediately gets more views. Your business also gets free marketing. The way in which this example business blog has set up their social media share buttons is typical of the design of many successful business blogs. Look down at the bottom of the page. The simple, circular buttons added to the layout make this business blog extremely shareable. When creating posts for your business blog, you will need to mix media with your text. Adding more diversity to your posts will help keep your readers engaged. When you do choose to add diversity to your blog’s media content, always use high quality materials. Low quality images and videos will slow your page down, and could cause unnecessary lag in loading speeds. Your blog should encourage people to interact with your organization by including an effort to communicate within the design. “Leave your questions or comments.” With an enticing call to action, what reader could resist the opportunity to share? Finally, you have to post regularly to maintain your readers’ interest in the blog. A blog that is dormant will quickly lose the focus of its readers. 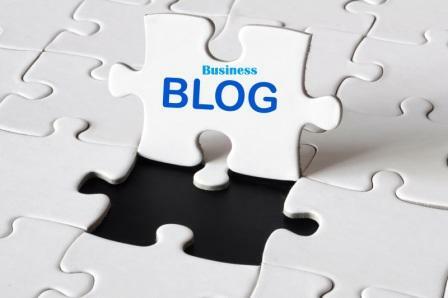 It is recommended that a business blog post at least once a month and no more than once a week.